I would imagine that floo powder can't be used when you are bringing all your suitcases with you for the school year, hence the need for the train. AS you can tell, I buy in to Rowlings stories, because I quite enjoy the way she creates an entire world, complete with all those little details. Barbara: I read in a forum somewhere last night the same rationale. The problem is that the readers are left to guess. It's the little details she doesn't supply. I suspect it's not to bring the reader in as much as it's because Rowling simply didn't think of it. 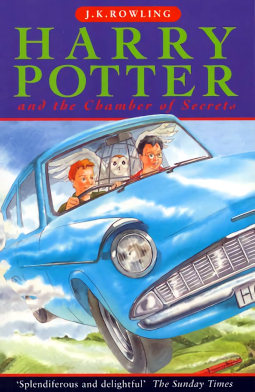 I liked the Potter books in the same way I once liked a bag of jelly beans. They tasted good going down but were soon forgotten. When I moved from my old apartment, I gave the set away to a random little girl who was in the lobby with her grandmother. I really haven't missed them since. I've read all the books but only seen the first three movies, so far, the books are better. She does cram a lot in there, but I have to say I still enjoyed the series. It got so many kids reading again. I cannot wait until my little guy is old enough to start reading them. Remi: I'm not a fan of jelly beans either. Wanda: I don't mind the movies, but they're probably on par with one another for me. Nadine: Oh I certainly respect the sheer number of kids who got excited about reading because of the books (even if half of that was marketing). I also think she turned kids on to the chunksters, once the fourth book rolled out. I can't stand reading books beyond five hundred plus pages and I see kids reading gigantic doorstops of books all the time.